On Monday more than 25 opposition groups flooded the streets of colonial Potosí to disrupt the government's official celebration of Bolivia's independence day. It had snowed in the city on Saturday, and melting snowmen decorated the main plaza. Alongside the national army and Congress there for the official events, hundreds of people turned out to protest President Evo Morales's plans to run for a fourth term in 2019. His bid was announced in late November 2017 despite a national referendum opposing a constitutional amendment to grant him another term. The protesters had wanted to fall in amongst the official government parade held in the morning, according to Bolivian newspaper El Deber. Perhaps unsurprisingly, however, by 7 a.m. all entrances into the plaza were blocked by police barricades. Only pre-registered organizations and people with press credentials were allowed to enter. "We are not even allowed entrance into our own independence day ceremonies," muttered one indigenous woman angrily, as she pushed past me in her pollera, a traditional Quechua skirt. Inside the plaza, a more modest crowd waved blue cardboard thumbs-up hands that said "Bolivia dice sí"—"Bolivia says yes." Yes to the re-election, that is. The morning ceremony was relatively uneventful, with the expected military parades followed by Vice President Álvaro García Linera's address and Evo's state of the union. The real action picked up after the official ceremonies were over: After the military parades and addresses from the president and vice president, the police barricades were disbanded, which allowed protesters to flood in with massive "BOLIVIA DIJO NO" banners—"Bolivia said no." No to the re-election, no to Evo's Movimiento al Socialismo (Movement Towards Socialism, MAS) party, no to the addresses that had been made by Evo and Linera less than an hour before. By many metrics, Bolivia has seen remarkable progress under President Evo Morales, popularly known as Evo. The country's "first indigenous president," as Linera emphasized to the crowd on Monday, can boast of achievements in economic growth, literacy rates, improved public health, and education initiatives—to name just a few. "We are in Bolivia's golden age, and it is defined by progress, production, and a digitalized youth," said Linera. Evo came to power in 2006. Following on the heels of a string of neoliberal, U.S.-backed presidents who struggled to maintain order without resorting to violence, his tenure has marked a new era of Bolivian politics—especially because he kicked out the U.S. embassy and refused all U.S. aid when he first entered office. And as he stretches for a fourth term, the president has emphasized this contrast between him and his predecessors. "The nationalization of our natural resources instead of privatization—that is one grand difference between us and them," he gave as one example. He also praised "Bolivia's incredible working class" to cheers from the crowd. But perhaps most strikingly, during Evo's presidency Bolivia has made unprecedented strides for indigenous rights. Indigenous peoples have been marginalized for almost all of Bolivia's colonial and modern history. Parents chose not to teach their children their native tongue to protect them. Bolivia was one of the poorest countries in the world, and its majority-native population were the poorest of the poor. Under Evo's new constitution in 2009, things began to change. The official name of Bolivia changed from "The Republic of Bolivia" to "The Plurinational State of Bolivia", plurinationality recognizing the diverse array of nationalities within one state polity. Thirty-six indigenous languages were recognized as official. The plurinationality of the new constitution seeped into many sectors of modern Bolivian life, such as education and public offices. The 2010 education law, titled Ley 070, required all school children to learn not only Spanish and "a foreign language" (usually English), but also the native language of the department in which they live. Currently, 34 of the the 36 officially recognized indigenous pueblos have their own language institutes located within their own communities. As of 2012, every public official has been required to speak not only Spanish but also the native language of the region in which they work. For the first time in Bolivian history, a woman can walk into a bank in La Paz and converse with her teller in Aymara. A man can walk into a hospital in Cochabamba and receive treatment from his doctor in Quechua. These policies, and many more, have changed the lives of millions of indigenous peoples in Bolivia. "Now in professional offices you see a woman wearing a pollera," a woman said to me during the protests Monday afternoon. "That never happened before Evo. Now people like me are ministers in the government. That's why I am a MASista, until I die," she said. On Monday, Evo ended his speech pointing to the global significance of his Bolivian experiment: "With all of our economic growth, Bolivia has a lot of hope. But what has been perhaps one of the most important changes? Bolivia has begun to be recognized internationally." 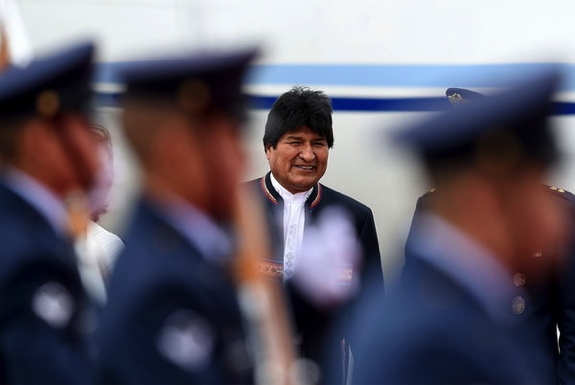 Bolivia's 2009 constitution, however, also limits presidents to two terms—which Evo has now served, in addition to his term prior to creating that constitution. And in February 2016, voters across the country rejected Evo's proposal to change the term limits, 51.3 to 48.7 percent. The opposition groups that travelled to Potosí on Monday are part of the "F21 2016 Movement"—named for Feb. 21, 2016, the date of that referendum vote. However, in November 2017 Bolivia's constitutional court annulled the referendum and struck down re-election limits on all public offices, claiming that re-election limits are a violation to human rights. A few days later, Morales announced his candidacy for the 2019 elections. If elected, he would remain in office until 2025, a term of 19 consecutive years. The F21 2016 "Bolivia dijo no" movement has been growing ever since. In the week following the court's decision, protests and blockades were staged across all major cities in Bolivia. That same week during judicial elections, over 50 percent of the ballots cast were null ballots—an apparent response from the opposition to intentionally cast null votes as a form of protest to Morales and his government. Throughout Bolivia's major cities, such as Cochabamba, La Paz, and Santa Cruz, graffiti in full view declares "Mi Voto Es Valido" (My vote is valid) and "NULO" (Null). This past Monday, the protesters held nothing back. "¿Si esto no es el pueblo, dónde está el pueblo?" ("If this is not the people, then where are the people?") was one repeated chant, referring to Evo's claim that he respects the people's wishes. "No es Cuba tampoco Venezuela, Eso es Bolivia y Bolivia se respeta" ("this is not Cuba or Venezuela, this is Bolivia and you respect Bolivia") was another. One especially strong one was "Muere muere Evo, Evo criminal" ("die, die Evo, Evo criminal"). Some protestors were less harsh. People of all ages marched, many donning homemade "Bolivia dijo no" and "F21" shirts. Women marched with their babies. One woman had her child's stroller decked out in "F21" memorabilia. I asked a nearby woman why she thought so many people still support Evo, and she turned to me and said: "Those people have clearly not lived what we have lived. We have nothing, Evo has not helped us. And we are sick of it," she said. In her view, Potosí remains impoverished, especially in the countryside. Beyond specific grievances with Evo's policies, many are also concerned about what an ignored referendum means for the state of democracy in Bolivia—and a democracy that has close ties to Cuba and Venezuela, the latter which under Hugo Chavez and his successor Nicolas Maduro has become what appears to be a failed state. "Bolivians, across all economic classes, are nervous about the implications of a President who is directly ignoring a vote of the people that he himself called for. They see the rise of violent authoritarianism in Venezuela and Nicaragua and wonder if this will be their country's future as well," said Jim Shultz, an activist and co-author of a book about Bolivian indigenous resistance to globalization, who recently returned from Bolivia to the US after living outside of Cochabamba for 20 years. In Potosí, the opposition appeared diverse and not necessarily unified. 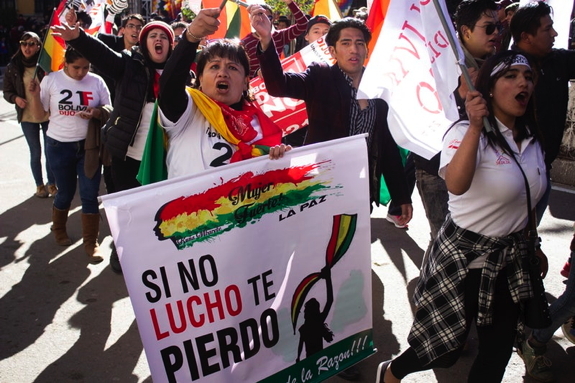 Ranging from groups called "Another Left is Possible" and "Bolivia Promised Me" to mining syndicates and coca leaf farmers from the lowlands, they declared their support for F21 from a diverse array of ideological and political motivations. Many of the opposition come from the left, claiming that Evo has failed to keep his promises as a truly decolonial and anti-extractivist president. Evo has opened up the country to massive mineral exploration—particularly to Chinese companies—despite claiming to be dedicated to the "Rights of Mother Earth". Dam projects in the Amazon on the Bala and Beni rivers have been approved by the government, despite indigenous protest. For many, the construction of the national highway in the Isiboro-Sécure Indigenous Territory and National Park (TIPNIS) despite indigenous and international protest was the final straw. How pro-indigenous and anti-capitalist, leftist critics ask, is Evo and his administration, really? Linera ended his speech by quoting Karl Marx and declaring that "capitalism has brought blood all over the world"—a nod to the millions of indigenous people that have died in Potosí's silver mines since the colonial period and are still dying today. "There is not another future," he said. "If there is something different, it is a cliff—it is the return to neoliberalism. The abuse of water and gas. The privatization of natural resources," he said, referring to the Cochabamba Water War of 2000 and the El Alto Gas Wars of 2003 that ultimately led to the resignation of Gonzalo Sánchez de Lozada "Goni" and Evo' selection. "The Agenda 2025 is the only option," he declared to a cheering crowd, referring to the prospect of Evo being in power until 2025. Revolution, according to this line of thinking, is tied to a particular man and his necessary re-election in 2019. "The insistence on re-election at all costs is a sad development for Morales and his legacy," said Schultz "His presidency has been historic and has accomplished a good deal, but ignoring the basic rules of democracy will put a stain on that, and maybe worse." The protesters who flooded the square following Linera's and then Evo's speeches seem to agree.